I have been able to spend extra time on crafting, while the hubby is away the wife plays, lol!! In the living room we have beige walls and so this needed to have a pop of color as well as to be subdued so to blend in the tiny room. I apologize for my photo it keeps casting yellow so this is the best I can get it. I included a brief photo tutorial on what I did. 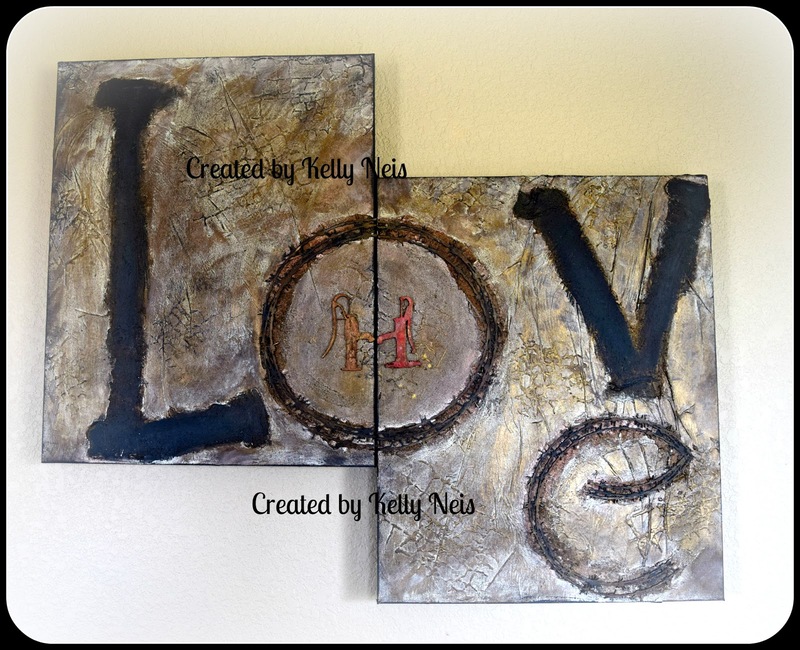 It is 2 canvases 16x20 inches each that I put together. The chipboard in the middle are 2 old fashioned water pumps that I put the spouts together, my hubby thinks he should have lived in the 1800's so this was appropriate for the canvas. The O and E are made from chipboard barbered wire. Here you can see the Tim Holtz Postage Tissue that I modge podged onto the canvas and let it wrinkle. I made the L and V with the Prima Texture paste shown below and put some under the barb wire too. I also used a Golden molding paste to make crackle texture with a mask here and there. To blend I used Martha Stewart paint in Linen for the background and the color Charcoal for the letters. After the paint and texture paste dried I sprinkled some Prima Mica powder in Rust around the canvas and brushed it in. This is the result after applying Mica powder and a few strokes of Linen paint again. Under the barbed wire chipboard is texture paste and I blended the 2 color bloom sprays together and it created a sanded rusty look. Wowsa!!! You did a fantastic job!!! I bet this will look so good in your house! Wonderful Kelly - you have been busy! My Son painted three small canvas years ago to go over his mantel. He is quite creative but he saw this type of painting using 3 different canvases at an art museum. Fell in love with the art work but could not afford to buy it. So off he went to Michael's where he bought three canvases all the same size. He bought several pastel colors in acrylic paints and some brushes. His creation is really gorgeous. I know you will enjoy you art work for many years. What is so much fun about this is that he has a Scott Andrew original that even surprised him. He has hung all three canvases on the same horizontal line with about an inch between each canvas . If this sounds a little off - I am a little off. I had oral surgery a week ago today - Unfortunately by Monday morning my face was huge so very swollen and painful. So I have been on a very heavy antibiotic and two different pain pills. One of the pain pills is a narcotic and I feel drunk and act it!! It has been quite painful - will be taking the antibiotic through this Sunday. Just think - you can change your art work on a whim. There is always a new season or a new topic or a brand new image.You have always been good with mixed media. good inch seperatr from the next canvas - Obviously he did an abstract.